2012 Agent Barometer global survey results are in! The ICEF i-graduate Agent Barometer, now in its sixth year, has elicited a record number of agent responses (1023 from 107 nationalities) for its 2012 edition, providing a robust and comprehensive understanding of the international education market as seen through the eyes of education agents. It is a great year to have such excellent participation in the survey, given the turbulence we saw quite frequently throughout the year in leading higher education markets. Various countries seemed to become either more welcoming or less so to international students as a result of such things as visa policies, national immigration climates, government/industry collaboration, marketing activities/bilateral agreements, and safety issues. Did such a year affect the attractiveness of the usual leading country’s appeal to international students, according to agents? To some extent yes, and to some extent, no. The combined responses of surveyed agents representing 107 source countries provide us this list of the most attractive study destinations in 2012, with the US in the lead (73%), Canada and the UK tied in second place (64% each), Australia in third place with 48%, and New Zealand in fourth (32%), just ahead of Germany (31%). Year-over-year, the most remarkable change among leading destination countries can be found in Canada. Since 2008, Canada has risen fully 15 percentage points in its perceived attractiveness among education agents. Compare that to the US (a gain of 5 percentage points since 2008), the UK (a loss of 7 percentage points), Australia (a loss of 1 percentage point), and New Zealand (a gain of 3 percentage points). In 2008, Canada was tied with Australia in third place; in 2012, it is tied with the UK in second. Asian agents in particular registered a great surge in how attractive they consider Canada. Also notable when we look at the years 2011 to 2012 is the fact that the UK remained stable despite fears that its more restrictive visa policies announced this year would dampen international student interest in studying there. Australia also held its ground, gaining one percentage point from 2011. This may come as welcome news to the Australian international higher education industry, which has seen billions of dollars disappear from the sector since 2009, and which is hoping to be on the road to recovery. Among emerging markets for study abroad (the top ones being China, Japan, Singapore, Malaysia, and South Africa), attractiveness rankings remained mostly stable year-over-year with China and Japan in the lead. When looking at emerging markets, what is most interesting is their popularity in certain regions. For example, Singapore is the most attractive among Asian agents, South Africa among South American agents, China among European agents, and Malaysia among African agents. 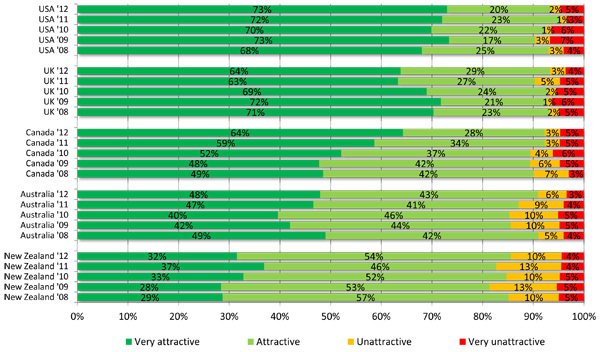 Attractive is one thing, but what’s the best? The US is perceived to be the best in terms of undergraduate, graduate, MBA, and work and travel programmes. The UK is perceived to be the best in terms of language programmes, secondary/high school, and foundation courses. Australia is perceived to be the best in terms of vocational education. Location and cost remain the most important drivers of destination choice, but access to visas and support for international students have risen as drivers over the past year. Language programmes (especially those lasting 2–4 weeks) are responsible for by far most agent placements (81%), but undergraduate (73%) and graduate programmes (70%) are becoming more popular. Nearly two-thirds (64%) of agents reported that changes in visa regulations over the last year have affected their recruitment activities. In terms of what they consider to be important marketing activities for institutions, agents were most likely to cite activities that assist agents in their work, such as being quick to respond to enquiries, providing agent manuals and workshops, and being in regular communication. Eight-in-ten agents expect the undergraduate and graduate markets to grow further in 2013. The Canadian government’s continued focus on international education and increasingly open immigration policy are likely factors in Canada’s ascent in the rankings. Meanwhile, despite the British government’s tightening of visa restrictions that had the university and college sector so worried this year, agents have not seen marked changes year-over-year in the attractiveness of this study destination, perhaps because of how historically well established the UK is as a leading study destination and because of the continuing prestige of British education and institutions. As for the stability of Australia’s attractiveness from 2011 to 2012, this may be a sign that Australia’s recovery – from, among other things, the hit it took in 2009 due to safety concerns for international students – is off to a good, if not dramatic start. For more information about the ICEF igraduate Agent Barometer, please visit the i-Graduate website and check back with ICEF Monitor for additional follow-up reports. This entry was posted in Africa, Agents, Asia, Australia, Australia/Oceania, Canada, Europe, Immigration, Middle East, Most Popular, New Zealand, North America, Regions, Research, South & Central America, United Kingdom, United States and tagged foundation programme, Most Popular, language learning, vocational studies, Trend Alert.